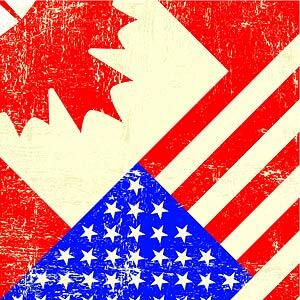 The Edmonton Emus have clinched the 2013 Women's National Title defeating the Calgary Kookaburras in Ottawa Sunday. For the Angels a heartbreaking 3 point loss to the Etobicoke Kangaroos in their last pool game relegated the team to a 5th place play-off against the Ottawa Lady Swans. 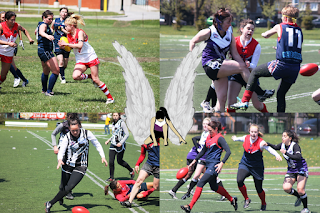 Despite a fantastic effort from the Angels, the Ladies from the nation's capital proved too strong taking the win and consigning the Angels to 6th place overall. It was an action packed first day at the Canadian Women's Nationals Saturday in Ottawa. The Angels split their results with a solid first up victory against the High Park Lady Demons before falling to the Edmonton Emus later in the day. Sister club the Ottawa Lady Swans were pipped twice, losing both their matches by 2 points. With the Edmonton Emus already locked in for a place in the final, Sunday's match-up between the Hamilton Wildcats and Calgary Kookaburras will determine their opponent. The 8 teams are split into 2 pools, the teams that finish first in each playing off for the cup. The second placed teams will contest a playoff match for 3rd, third placed teams for 5th, and finally the bottom placed teams will fight out for 7th. Sunday's prospects: It means a win for the Angels Sunday will see them finish second and play the loser of the Wildcats v Kookaburras match. A loss will see the Angels finish third and face a playoff for fifth against Ottawa provided the Swans can take the points over the Blues. Results: Pool A - Emus 32 def. Roos 2, Angels 29 def. Demons 0, Roos 44 def Demons 7, Emus 49 def. Angels 0. Pool B - Wildcats 29 def. Swans 27, Kookas 24 def. 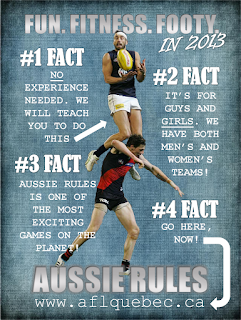 Blues 8, Kookas 33 def. Swans 31, Wildcats 48 def. Blues 0. 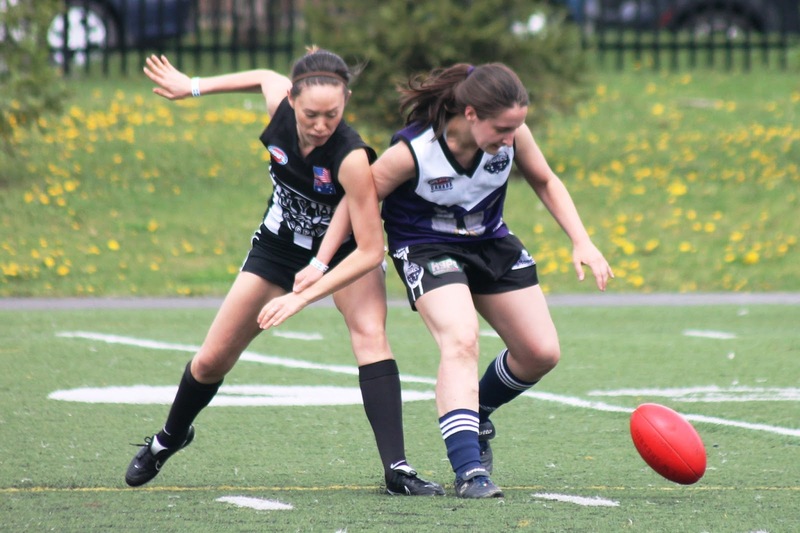 The Montreal Angels will contest the 2013 Canadian Women's Australian Football National Titles this weekend in Ottawa. 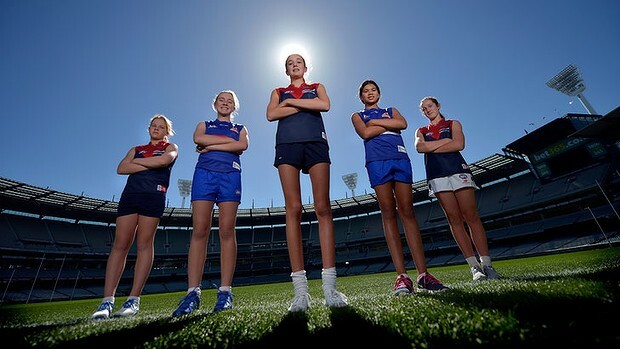 Along with seven other teams the gruelling tournament will be played out over two days, the Angels taking a squad of close to twenty to the prestigious event. Aimee Legault will continue her role as head coach having orchestrated several punishing victories over both Boston and New York in the lead up to the championships. First held in Alberta in 2009, Quebec won the right to host the 2010 Championship and pulled off a major upset when the Angels defeated the highly fancied Edmonton Emus in the final. After two years in recess the championship is back bigger than ever with 8 teams from three provinces competing. 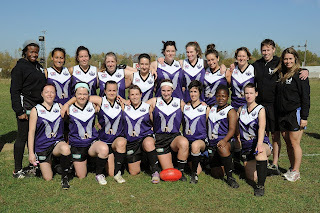 For more information on the Angels quest for their second National title visit www.ottawaswans.com. In sweltering conditions the Montreal Angels have stormed to two convincing victories in Boston. 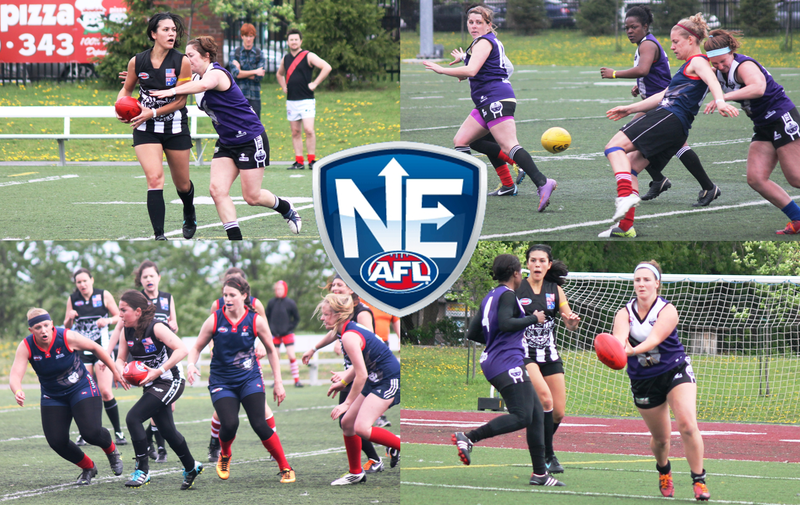 The Angels overcome a fierce Boston Lady Demons to claim the first win of the day 5.11 (41) to 1.2 (8). 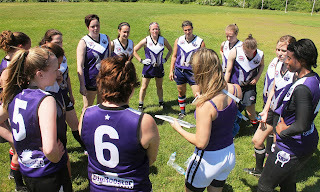 In game two the Lady Demons fought off a determined Magpies unit to claim their first win 4.7 (31) to Magpies 2.2 (14). In the final match the Angels hit their straps romping away to a massive 88 point win, Angels 14.4 (88) to the Magpies 0.0 (0). Full match reports coming soon. The Montreal Angels return to Boston this weekend to defend their crown against the New York Lady Magpies and Boston Lady Demons in what has fast become one of the highlights of the women’s football calendar. The tournament will also double as round two of the North-East Women’s shield which adds another exciting dimension to the weekend. (2012 Tournament: 1-1 2nd overall, 2013 North-East Standings: 1-1 (3pts) currently 2nd). If there’s one given in life it’s that no one takes a win from any Boston team on home soil without a fight. The Lady Demons proved that last year, controlling the play in both matches for the entire day before a five minute lapse saw them slip up with literally sixty seconds on the clock. The Lady “Dees” form in the Montreal Preseason Cup was quietly impressive. Without some of their superstars the Dees managed to put together some outstanding passages of play and looked deadly through the midfield. With a full squad on the park the Demons will be expecting nothing less than outright champions for the day. Players to watch: Second year player Holly Teufel is the current North-East Shield leading goal kicker. Her high flying marks and amazing boot make her a nightmare for opposition defenders. Expect Teufel to feature in both the Magpies and Angels key match-up strategies. Emily Reihl’s return to the line-up will be a major boost. The dynamite onballer oozes class and has the ability to win a game off her own boot. With outstanding agility and speed Brighde Sullivan has fast become a focal point up forward and a big threat in front of the big sticks. A much welcomed presence across the backline, Jen Vogel’s experience and deft touch will ensure that every opposition score is a hard earned one. Joining an already star-studded midfield brigade, rookie Sarah Morin’s ability to break up plays and create opportunities through the center adds yet another gold plated cog to the well-oiled Boston midfield machine. North-East Shield Prospects: Two home victories could see Boston claim outright first on 7 points. (2012 Tournament: 0-2 3rd overall, 2013 North-East Standings: 0-2 (0pts) currently 3rd). The Magpies have the makings of a champion team, the task ahead is now how they get those talented puzzle pieces to fit together as a consistent and cohesive unit. It was a tough day out in the 2012 Boston tournament, New York failing to register a goal. But promising early signs of the Lady Magpies version 2.0 were on display in Montreal when they seized an early lead against the Angels and dominated much of the play in the first half of game one. Now the challenge is to string those purple patches together for four quarters. The steps of progress are clearly apparent from the black and white army, don’t be surprised to see a giant leap from this team come Saturday. Players to watch: As the Magpies develop and get the ball into their attacking half more expect to see much more from exciting second year forward Lissette Hinjosa. The pocket rocket has talent to burn and will be a key ingredient to the Magpies rise up the table. The Lady Magpies will also welcome back from injury 2012 rookie of the year Alison Vorsatz. Her sublime work across the backline and ability to do the job in the ruck making her a prized asset to the Magpies fortunes. Sam “the silent assassin” Wolf’s nimble footwork and ability to burn her opponents with her speed will ensure the rival coaches keep a close eye on the Magpies secret weapon. North-East Shield Prospects: Traveling for the second consecutive round any away victory will ensure the Magpies are right back in the hunt for the shield. (2012 Tournament: 2-0 1st overall, 2013 North-East Standings: 2-0 (4pts) currently 1st). It will go down as the heist of 2012, the Angels playing five minutes of inspired football that literally snatched victory from the jaws of defeat in Boston. The Angels of 2013 will be a very different team, former star player and avid Harry Potter fan Aimee Legault now in the role of head coach. At her disposal is one of the Angel’s finest emerging teams with a wealth of first and second year talent coming through the ranks. The Angels will head to Boston confident they can get the job done, but fully aware it will take their very best to do so. Players to watch: One of the most exciting players to watch Tara Cools-Lartigue has quickly developed into an absolute ball magnet. Playing as a defensive midfielder Tara’s ability to make her mark on the game is never questioned. Rookie Robyn Graham was thrown into the deep end on debut in Montreal playing through the midfield. The cream always rises to the top is an understatement for Graham who was amongst the Angels best with plenty more to come. Not many players have the confidence to develop and trademark their own move, but Lindsay “Spinorama” Belzie has done just that creating a highlight reel with her goals up front and slipping into equal second for the North-East goal kicking table. Impressive in her 2012 Boston debut and improving at a thunderous rate is the Angels Kelsey Martin. 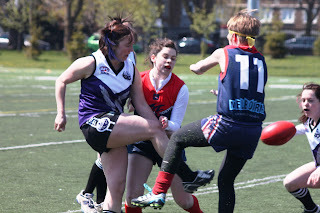 Martin’s adaptation to Aussie Rules and football smarts make her one of the most important links in Montreal’s forward line. North-East Shield Prospects: Leading the table by the smallest margins it’s all or nothing for the Angels. Two wins will give the team plenty of breathing space while any loss will see them swallowed up by the pursuing pack. 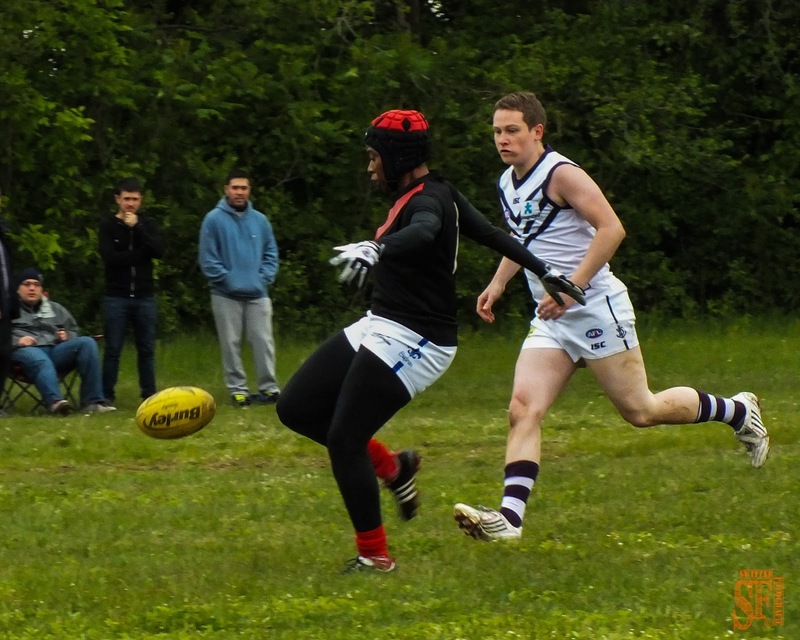 Several players from the Montreal Angel's roster will be in action this Sunday for AFL Quebec Round 2 being played at Parc Champetre in Montreal. Always a factor in their team's chances to secure a win last week Lindsay Belzie (pictured) and Margo Legault opened their scoring accounts with a goal each. This year the celebrations will take place in the sands of Griffin Town and everyone's welcome! This party has everything from Footy, Cricket, Beach Volleyball, live DJs to pies from Tourtiere australienne. 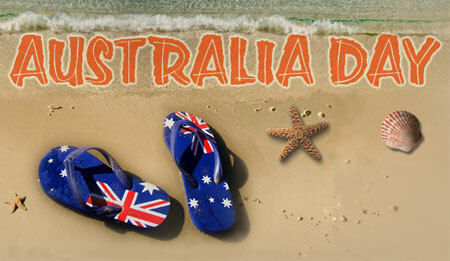 Even a Magic Photo Booth that will transport you to Australia! 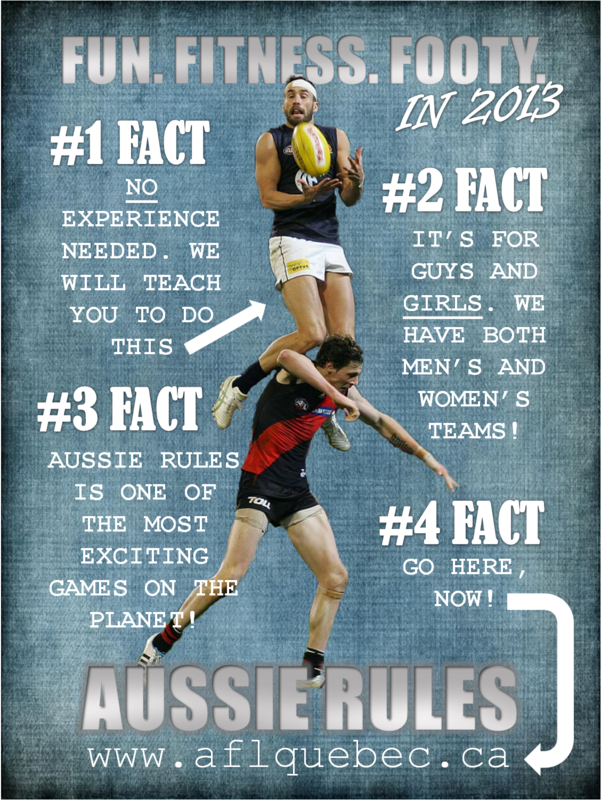 Entry fee is 15$ and all proceeds will go to support Australian Football in Quebec.